“Desert Kill Switch” by Mark S. Bacon opens with former cop Lyle Deming finding a bullet riddled body lying out in the desert, next to a 1970s Firebird. When the car and body disappear minutes after he notifies the authorities, Lyle is stumped. Working as a taxi cab driver at a retro theme park known as Nostalgia City, Lyle suspects the car originally came from there. He gets distracted from his investigation when his very tall, attractive friend Kate Sorensen, finds a body of her own while she is doing PR work for Nostalgia City at a big car event in Reno. Kate’s situation is more complicated because the police found her with the body, a disliked Las Vegas auto dealer, with whom she had recently been seen arguing. Lyle and Kate are determined to find out who really murdered him so Kate will be cleared as a suspect. The more they learn about the victim and his shady business, the more complicated things get. It also appears that both murders might be linked. This situation forces Kate to go undercover and into hiding. As their search for answers deepens, both Lyle and Kate’s lives are in danger. Solving this mystery is critical. 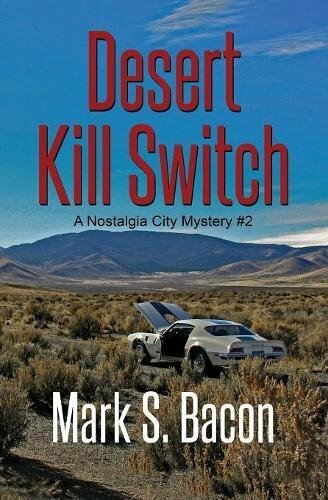 “Desert Kill Switch” is the second book in the Nostalgia City Mystery series. Not having read the first book, I feel that this second volume stands well on its own. I would like to go back and read the first one and read the next one in this series. I really enjoyed the whole idea of Nostalgia City and the incorporation of vintage cars, especially the American muscle cars. The desert setting also adds a nice touch, since I am a desert inhabitant. The hero and heroine are very likeable and their chemistry with each other adds suspense to the story. The contributing characters tend to be eccentric and quirky which makes them more interesting. The mystery was a fun one and I think that most readers will enjoy trying to figure out what happened to both bodies. “Desert Kill Switch” by Mark S. Bacon is highly recommended reading for mystery fans.